Another day, another haul. I haven't done a haul for what seems like months, and probably is months, but I am trying to elongate the festivities and what better way that to shop you the bargains I picked up in the sales. I didn't get these on Boxing Day, but the following few days count if you ask me. I did get some clothing but it was awkward to photograph, so you will have to wait until some fashion posts for them to get their debut. So, these items are form Matalan and ASDA both of which, places I don't tend to shop in on a regular basis, but these bargains definitely will be getting a lot of wear. So, the 3 jewellery items are from Matalan all of which were half price in the sale. 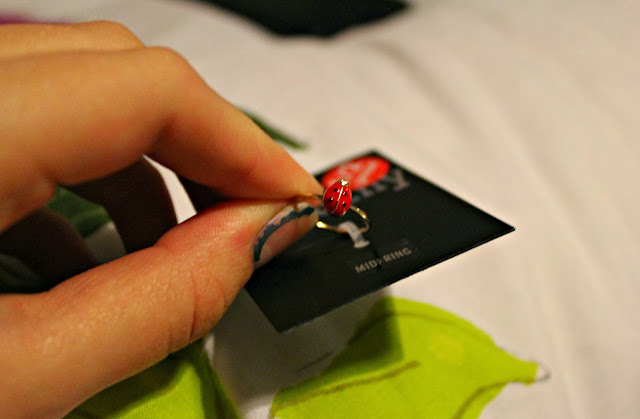 The first is currently on my finger now, and is this adorable midi ring, which has a ladybird on it for detailing, and I thought this was the cutest ring ever. This was £1.50 half price, which is a bit of a bargain. I also got this pair of round earrings, which have some jewel detailing all over, so for a little bit extra bling when you wear them... Did I actually just say that? 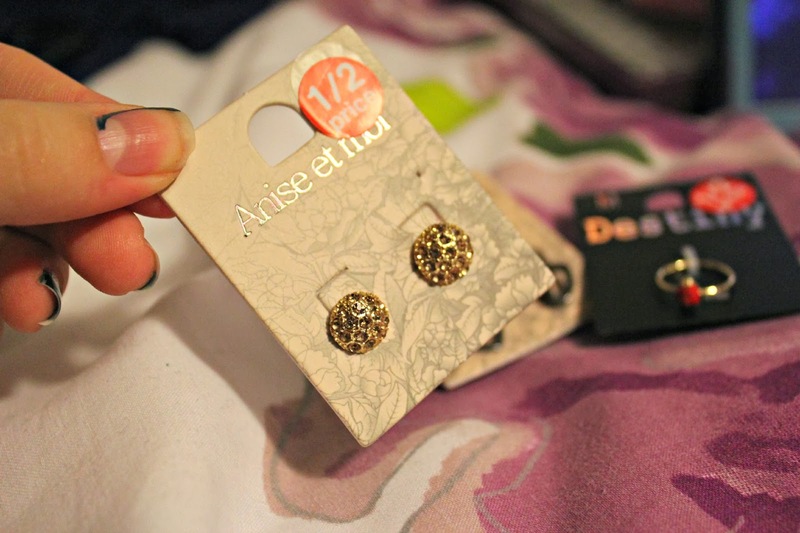 But cringe worthy phrases aside, these were £1.50 too, and I am excited to get some wear out of these. 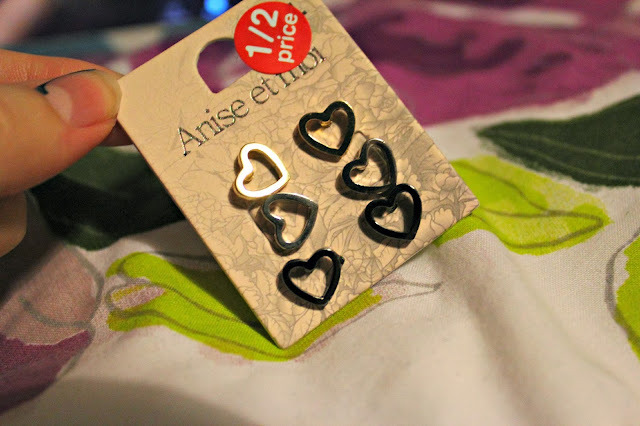 Finally on the jewellery front, I got this set of 3 pairs of heart shaped earrings. There is a gold pair, a silver pair, and also a gunmetal shade which is really edgy, but the heart shaped frame still makes them look dainty. So, the other two things were kind of on the knitwear side of things. Also from Matalan I got this purple/aubergine chunky knit scarf with some fluffy tassles at the end and a tiny bit of shimmer in it if I am right, and I absolutely love this. I may be a few months behind, but I now have a scarf which shall be keeping me cosy in the upcoming few months. That isn't to say though, that I will stop hunting for the perfect tartan scarf must I add. This was half price at £3, so totally worth it. 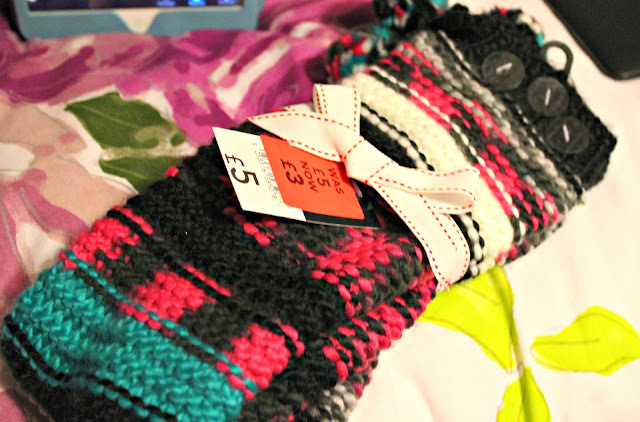 Finally, from ASDA I got these huge, chunky knit, colourful long socks, which I have been wearing a lot, just lounging around the house. These were also £3 (from £5), and I shall me wearing these oh-so-much. 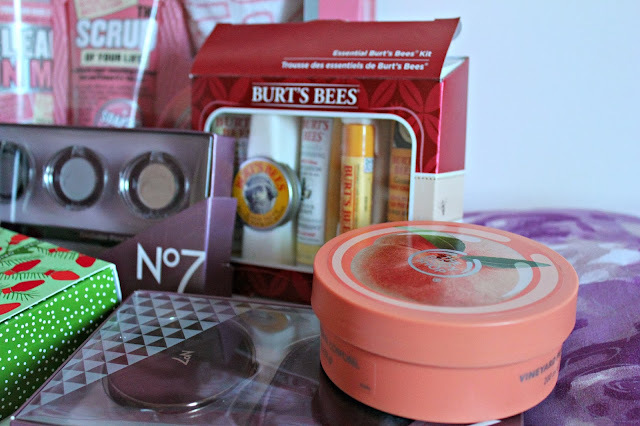 For the first year, I got up slightly earlier in order to make my way to the local town centre to grab some beauty bargains (the Boots half price sale was where I was headed first, of course). I got a few bargains, as well as some great fashion and clothing bargains, so if you were interested, let me know in the comments if you would be interested in seeing a post on those bits. 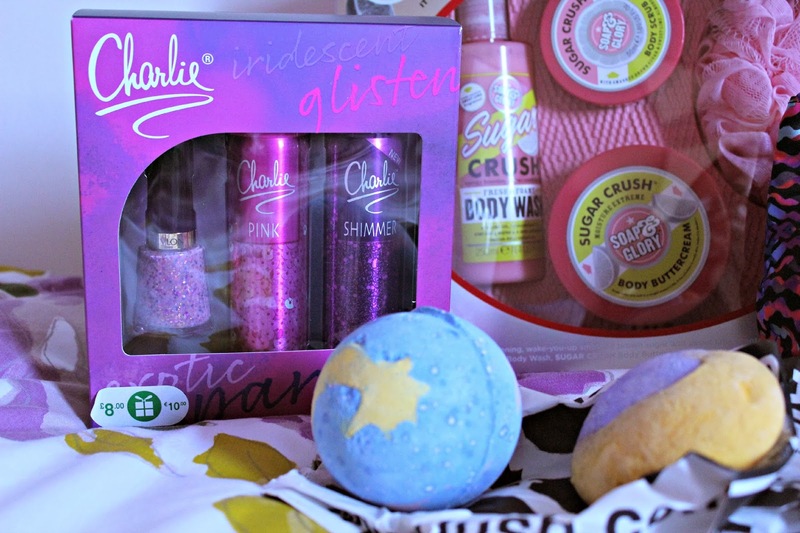 The first item I got in Boots was the Soap and Glory Once Upon A Lime gift set, which was halfprice from £18 to £9, which is a bit of a bargain, considering you get a full sized Sugar Crush Body Buttercream, a mini of the Sugar Crush Body Scrub and also a half size of the Sugar Crush Body Wash, along with a shower puff, coming in at a value of around £19.75 so even at full price the value was there. 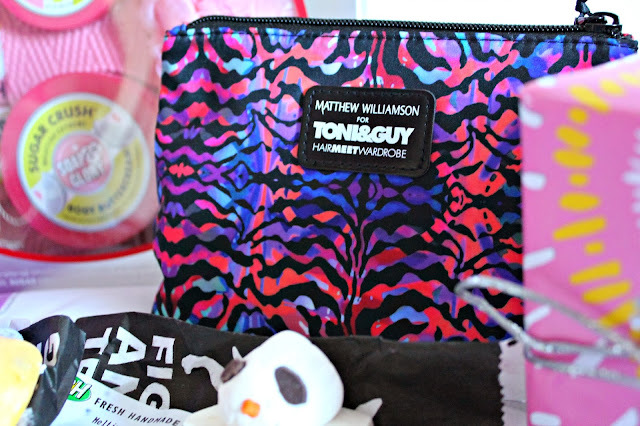 Also from Boots, I got the Toni & Guy Matthew Williamson for Toni&Guy Hair Meet Wardrobe set, which was £6, containing what I would say are deluxe travel sized/mini products, one being the Prep Heat Protection Mist, another the Cleanse Dry Shampoo, and the last being the Creative Firm Hold Hairspray and the packaging and bag are just gorgeous. Finally, I got this Charlie Set which has 2 body sprays, and a Revlon Girly Nail Polish which I have been wanting to try for ages, and the set totalled in at £4, which is 2p over half the price of the polish alone, so another bargain there. Moving onto Lush. I got 3 induvidual products (well, 5, but 2 of them were for Megan), and a boxed set containing 3 more products. The Snow Fairy Box Set was £6.25, which included a 100g Snow Fairy Shower Gel, a Shimmy Shimmy Shimmer Bar and a 70g Angels Delight Soap all of which smell incredible. I got the Shoot For The Stars Bath Ballistic (x2), which smells like fresh, uplifting citrus, and I cannot wait to plonk this in my bath. 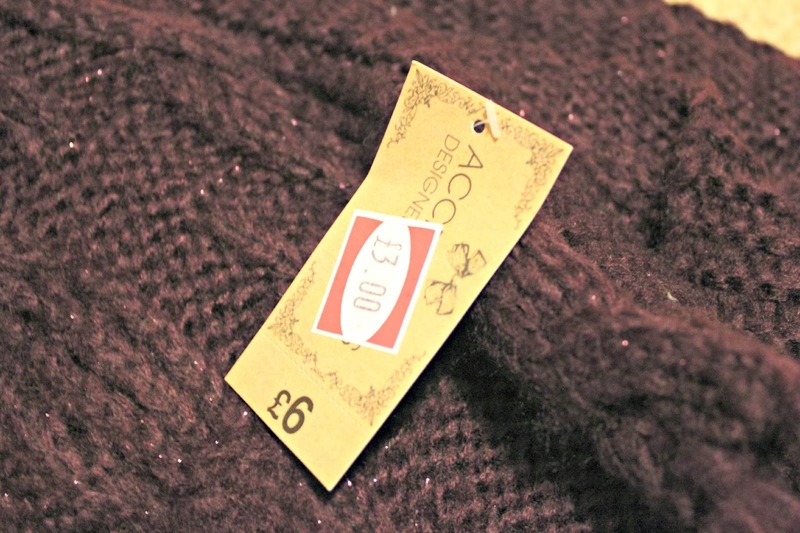 I can't quite remember the price, but it was 50% off in the sale, so was most probably a bargain. The other which I got 2 of was the Christmas Eve Bubble Bar which is a calming, slightly floral (I would like to say subtle lavender), which is going to be something I use a lot at night to relax. Finally, the Melting Snowman Bath Melt made it's way into the basket, and is a creamy, slightly spicy and cinnamon scented melt, and I cannot wait to use this one also. All 5 individual products, and the box set came in at £13.35 which is bargainous. Cliche blogger introductory paragraph, but I'll put it short and sweet. I'm NOT bragging, and am extremely grateful for absolutely everything you see here (I also got other non-beauty bits too, but they aren't being featured here, and some of the things didn't get into this photo haha). So, first with the bath and body items. I got the Soap and Glory Relaxstation set, which basically, I have just been smelling for the past 3 days, and I may be a little addicted. From my little sister, I got the Body Shop Vineyard Peach Body Butter which is the thickest, most nourishing body butter you ever did see, and it literally smells like someone crushed up a peach and put it in this pot - love. On the same front I got the Burt's Bees Essential Kit which contains a cleanser, hand salve, body lotion, foot cream and a lip balm (which I was most excited about). Onto makeup. 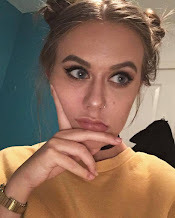 So, I was lucky enough to receive MAC Woodwinked, coming in at my first every MAC eye shadow, and the colour is just simply be-a-utiful, a golden, bronzey colour which just pairs nicely with my brown eyes - yay! I got the Smashbox It's Your Prime Set which contains 3 primers; the famous Photofinish Foundation Primer, the new Hydrating Undereye Primer and also the Photofinish Lid Primer all of which at first impressions are great. I also got the Real Techniques Stippling Brush which I have wanted for ages for light foundation application and cream brush, and I am loving it. 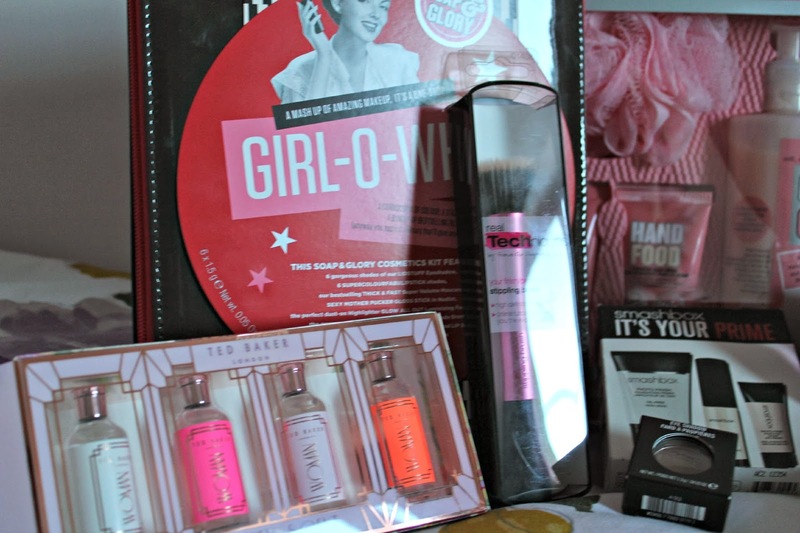 The Soap and Glory Girl-O-Whirl was a total surprise to me, which my mum had picked out when it was on the star offer in Boots (you chose very well mum! ), and it has an array of products in it which I have been lusting after for ages now. I also got 2 No7 sets, one of which being the one with 2 brushes, and 3 shadows which you saw in my wishlist post, and another with a compact mirror and case, in it, both being from my Nan and Granddad. The Origins Mask Marvels Set turned up under the tree, so I am excited to trail (and review of course) 3 fabulous masks from Origins , 2 of which have gained a cult-status in the beauty world. Finally onto fragrances. I got the Body Shop White Musk Smokey Rose Fragrance Mist which is a lovely, slightly lighter version of the original EDP, but still smells just as good as it. I also got this adorable set of 4 of the Ted Baker Women scents in a set called Heaven Scent which are so feminine, but not too overpowering, and the packaging on top of that receives an A* from me. 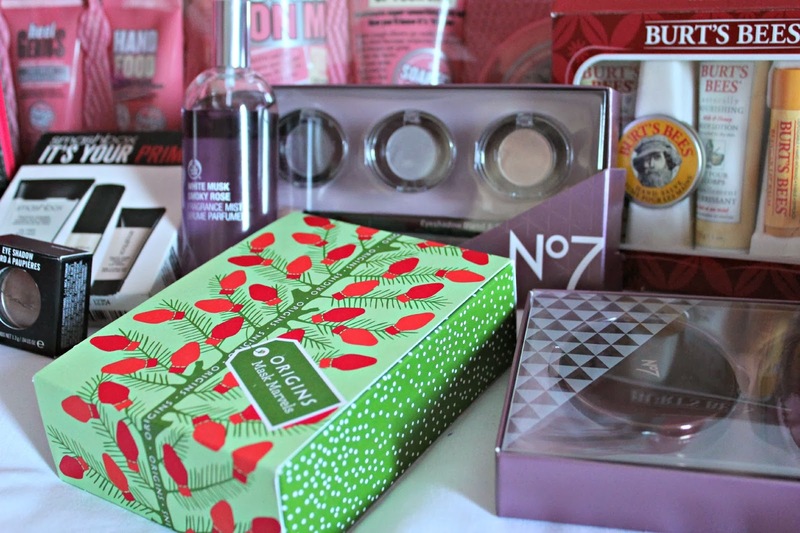 So those were the majority of the beauty based gifts that I got this year, and I can assure you, the money I received was well spent buying more beauty (and some fashion) bargains in the Boxing Day sales... oops. I thought I had resisted the whole 'beauty advent calendar' thing, but when I went to the Clothes Show Live on the 9th, the Ciaté stand were selling off the Mini Mani Month for £10. Yep, a tenner. I couldn't resist, and now I think I have enabled an annual tradition for me... Oops. 24 mini polishes are included, ranging from caviar, glitter, sequin, pastels, brights, and dark colours, and I will be sharing my favourites of the bunch with you. Starting with the 'effect' ones, my favourites have to be the Sequin in Dallas Dolly, which is just full on festive, with a range of glitters in gold, red, and olive-green tones. Another I like, but am yet to try is the Glitter in Twinkle Toes, a holographic glitter, which would be messy, but I think would be worth it for a New Year's Eve accent nail. The caviar ones are still waiting for my seal of approval, I like the effect, but they didn't last long. One I do like is a topcoat, which is called Snow Globe full of iridescent flecks and flakes, almost a pastel version of Gosh Rainbow. The pastels basically owned it in this calendar, and they will be getting a lot of wear throughout spring. I am slightly obsessed with mint green, so Pepperminty got me very excited when I opened the door. Hoopla is such a cute colour. It is peachy, pinky and just incredible. I don't even know how to explain it, I just love it. Another one is Sugar Plum, which is a pastel, pale, lilac-purple colour, which adore. The other 2 pastels are also stunning, and go by the name of Chinchilla and Candy Floss. Onto the brights, and there are only 3 I would class as all that 'bright'. The first is Hopscotch, which is a true orange, and believe it or not, I don't actually own any of those (I have an OPI, but it is slightly more red I believe), so this will be worn a lot in the summer. Another is Main Stage, which isn't even all that bright, but I included it in this section anyway. It is a nice medium-dark pink/fuchsia colour, and is Playdate which is a bright, slightly red pink, which is just so summery, and I want to slather it all on my nails now. Onto the dark colours from the bunch. First up, is Starlet a duochrome bottle of magical-ness. You think it's purple, then it is slightly olive, then it is full on emerald - love. Boudoir is just a classic red, which suits me really well (sadly a rare occurrence for me and red polishes), and is just so classy. Tweed and Tails is something completely original in my collection, being what I would describe as a dusty khaki, and is so Autumnal. Finally, we have Encore! which is a slightly darkened and muted orange, which is another autumnal one, although you could definitely make it work all year round. It seems I've been bitten by the beauty advent calendar bug, but I guess we will have to wait another year to find out if I buy one.. Everyday, at school, I will sit in assembly and stare at the 'split ends' I am oh-so paranoid about. No matter how frequently I get my hair cut, because it is so thick, it often feels dry and I get a little panicky about having split ends. Everyone tells me I don't, and Megan even got me this Schwarzkopf got2b Oil-Licious Tame and Shine Hair Oil probably to stop me banging on about my ends, haha. So, basically, this oil is meant to absorb instantly, leave your hair shiny and smooth, and also tame any 'wild' hair. I think it is safe to say (for me anyway), this does just that. I even used this while blow drying yesterday - something I rarely do, but I had to out to the supermarket with my mum and my hair was dripping, and boy, did it make my hair soft. It has argan oil in it, which is an ingredient everyone has been going a bit cray about over the past year or so, and I can definitely see why. After using this oil, I just want to flip my hair luscious locks all over the place like I'm in an advert. It smells incredible too, but I can't put my finger on the scent. P.S: Thanks so much for 300 followers! An early Christmas Present for me!